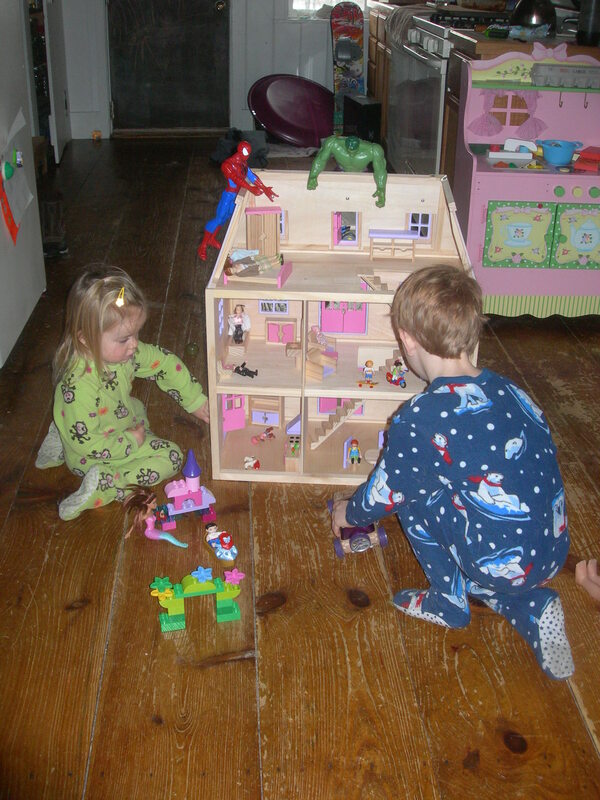 I love the way toys get combined into imaginative play scenarios. Superheros, pirates, dolls, and princesses and mermaids have all been included in some crazy schemes lately. We have been spending a lot of time in our pjs just playing the day away. I am not anxious for this holiday break to end. Still, looking forward to some serious fun in the new year! We had a beautiful day yesterday on the pond. Five full hours of ice fishing, ice skating, snowman building, sitting by the fireside, and enjoying a lot of fun with family. Josette has been anxious to try ice skating since seeing her bigger cousins at it. Well, it was serendipity when Nana pulled out a pair of pink ice skates that Libby wore and now fit Josie perfectly. She was a trooper on those things. She practiced several times yesterday and very much wanted to do it all on her own. By the end of the day she was pushing a chair around on the “rink” on her own. This proud mama was quite impressed! I only got video of her initial trials; there is a lot of slipping, but she is always smiling and anxious to keep at it. Uncle Jonny has a knack for picking some seriously fun little boy gifts for Christmas: recall the drum set a couple of years ago. This year, Finn got a snowboard and we have been out on the hill every day with him practicing. He is getting better and better, but his main goal is to just point it straight down the hill and then bail out. But, he always giggles and trucks back up the hill for another run. Sledding, skating, presents….cousins, family, fun……lots of love and joy! We have had such amazing and beautiful snow here and we have put our sleds to use every single day since the first dusting. It was certainly time to get out all the other snow gear; snow shoes and skis! I mentioned to the kids I would go up in the attic and bring it all down with the vague time reference “sometime later.” Well, they were thrilled and it had to happen right now! with Josette asking, “Do I have snow shoes? Do I have skis? I want to snow shoe!!! I want to ski!! !” Finn was kind enough to lend his snow shoes to get her started while he took off on his skis. Josette was incredibly determined to get through that snow and she was very proud to use the shoes. It was certainly difficult for her as the shoes were configured for Finn’s boots and the snow is very deep. Finn’s entire goal was to go as fast as he could on his skis and get to the most steep down hills he could find. Then, Josette chased him after I got the snow shoes off of her and she would tackle Finn and “help” him up whenever he fell. Eventually we made it back to the sledding hill so Finn could build up his jump. Goodness, the enthusiasm and daring of these children is awe-inspiring, somewhat scary, and downright exhausting! We decorated gingerbread houses this morning. It was messy, sugar-filled, and plenty of fun. I daresay I took the easy way out this year and bought a kit. It pained me slightly, but as Christmas is rapidly approaching, my goal is to remain stress-free and joyful. So when I saw a mini gingerbread village kitwith 4 houses inside, I snatched it up and it was perfect for our purposes today. As I did last year, and I highly recommend, we just used hot glue to get the houses together fast. We aren’t going to eat them, so this way you don’t have to hold the pieces and wait for icing to set up or worry about kids pushing on them too hard with the candy and crashing them in. I did add whatever fun things we had in our pantry for decorations: coconut makes for good snow and marshmallows are fun snowballs. Finn was quite intent in his decorating this year, with just a few tastes, while Josette was happy to taste as much a possible and decorate on the side. Still, some lovely works of art were generated and added to our festive atmosphere. We will be doing some serious cookie baking in the next couple of days.